FIVE WAYS TO EAT RIGHT DURING NATIONAL NUTRITION MONTH (AND ALL YEAR LONG!) - What About Watermelon? 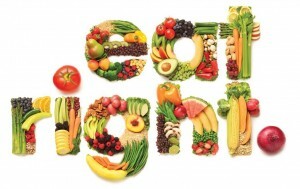 Did you know that February is National Nutrition Month? It’s true! There’s a website for it and everything. Turns out, National Nutrition Month has been happening each February for the past 40 years, with the goal of helping people eat right and exercise more. I’ll be the first to admit that I should probably eat better and exercise more. I’m not overweight, mind you, but being overweight isn’t the only consequence of a poor diet. And so, being inspired by National Nutrition Month, I scoured the Internet for five of the best tips on how to eat a little better this month and all year round. EAT MORE OATMEAL FOR BREAKFAST – When I was a kid, I ate oatmeal all the time. I don’t anymore, which is a mistake, because oatmeal is A) delicious and B) good for your heart because it has lots of soluble fibers, which reduce your cholesterol. If you want to take your oatmeal to the next level, add some watermelon to it (or on the side). It’s good for your heart, too! EAT MORE SALAD WITH DINNER – A colorful salad (one with dark greens, tomatoes, yellow peppers or even watermelon) is loaded with different vitamins and minerals. They’re also low in calories (as long as you hold the cheese and ranch dressing) and will help take the edge off your hunger, so you don’t go overboard during the main course. USE SMALLER PLATES AND BOWLS – This really does work! Studies have shown that when we use smaller plates and bowls — and even spoons and forks — we eat less. Turns out, the small plate gives the illusion that our serving is larger than it really is, which tricks our brain (and our stomach) into thinking we’re full. EAT RIGHT AT RESTAURANTS – It’s easy to overindulge when you dine out, but it’s also easy to make the right choices. Many restaurants include nutritional information on the menu, so pay attention to that when choosing your meal. Also, don’t feel compelled to clean your plate. Many restaurants will give you more than you really need, so eat half and take the other half home for lunch the next day. COOK WITH KIDS – This tip may or may not help you eat better (it depends upon what you’re cooking), but it’s a great tip nonetheless. When you cook a meal with a kid, and share the experience of preparing a meal, you’re not only creating a bond with the child, you’re teaching them that food — hopefully, healthy food — can be fun.